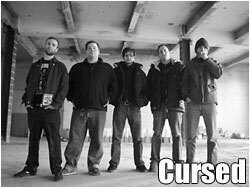 If you were unfortunate enough to miss out on Cursed's "One", then the numerical odds are in your favor for their upcoming second slab of devastation, "Two". Able to carve out metal with enough sinister intent to rightfully earn themselves the tag of "death 'n roll"; these Canadian shredders now possess enough firepower to wage war on all fronts and have already begun laying out plans to do just that. Judging by the above-mentioned tracks, it appears America may actually have some competition for a casualty count in 2005. Take a listen and add yourself to the list.